Honda’s CR-V is already one of the most popular compact SUVs sold around the world. More than 750,000 units have been delivered in Europe since it was launched in 1997, with nearly 50,000 sold during 2014. In the first nine months of last year, the CR-V was the world’s best-selling SUV. 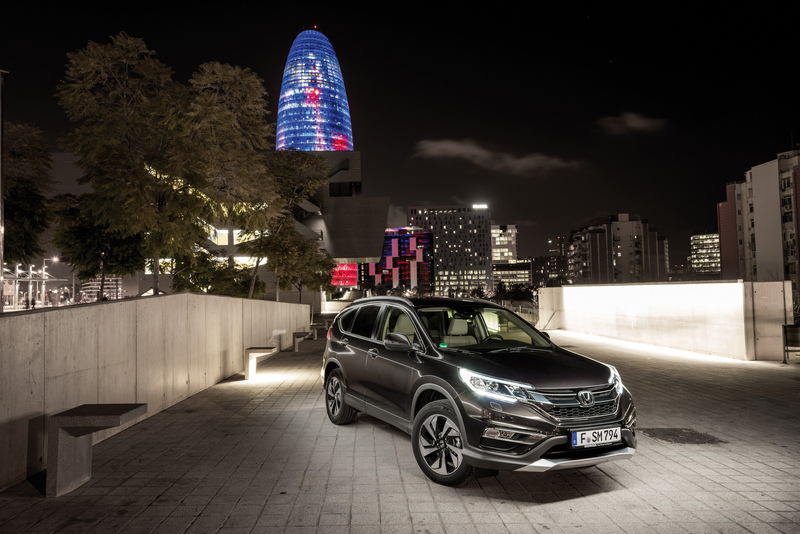 The model has become fundamental to Honda’s success in Europe, and a comprehensive range of enhancements to the fourth-generation CR-V will now further broaden its appeal. The new-look CR-V has been developed and engineered for British drivers and will be available in showrooms from Spring 2015. The new-look CR-V is offered with a more powerful diesel engine as well as an optional efficient nine-speed automatic transmission. Available with the four-wheel drive CR-V, the new higher-powered 160 PS 1.6-litre i-DTEC four-cylinder diesel engine, from Honda’s Earth Dreams Technology series, delivers outstanding performance and low CO2 emissions. The 2015 CR-V will showcase the all-new Honda Connect in-car audio and information system. Honda Connect offers convenience and connectivity while on the road, with key features including DAB / FM / AM and internet radio, Bluetooth connectivity, internet browsing, satellite navigation and rear-view parking camera. Honda Connect is compatible with Android 4.0.4, the world’s most popular Smartphone operating system, using familiar pinch, swipe and tap functionality – all accessed through a seven-inch display screen. The 2015 CR-V will premiere Honda’s new Intelligent Adaptive Cruise Control (i-ACC) system as part of Honda’s commitment to ‘Safety for Everyone’. Capable of predicting and automatically reacting to other vehicles ‘cutting-in’ to the vehicle’s lane, based on extensive real-world research of typical European driving styles, Honda’s i-ACC uses a camera and a radar to sense the position of other vehicles on the road. It then applies an algorithm to predict the likelihood of vehicles in neighbouring lanes cutting-in, enabling the equipped vehicle to react quickly, safely and comfortably. This entry was posted in 4X4 Car, Car Updates & Releases, Crossover Cars, Manufacturer News, New Cars, News and Views and tagged honda, honda cr-v, lease a honda cr-v, new honda cr-v by David Petherick. Bookmark the permalink.